Say goodbye to getting wrapped up in miles of cord connecting your MP3 player to your headphones as you listen to music. These little earphones, named Split, make up a completely wire-free music player in their own right. Though only in the prototype stage, it's designed to have 256 megabytes of memory and can be controlled through a simple click of the jaws. 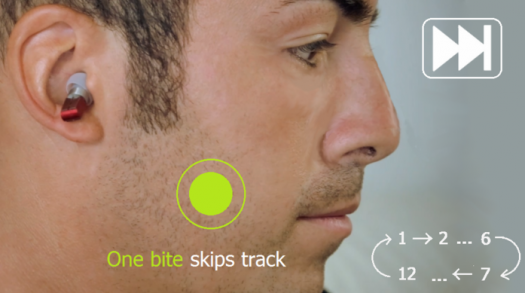 Split's creators are looking for $435,000 in Kickstarter funds to work out the last kinks in manufacturing and design and get them nestled in your ears. Here are the basics: The magnetic earphones turn on when you split them apart. Since there is no cord to connect the two earbuds, they're essentially two MP3 players that play your music at the same time, synchronized by radio waves. Bite once, and a built-in accelerometer will tell the device to cycle through tracks. Bite twice in a row to adjust the volume. If you want to use it while eating or chewing gum, you can lock the player by tapping the right earphone. Split can only store around 24 songs, according to the Kickstarter campaign, so this wouldn't be something you'd depend on to entertain you through a long trip, but it seems perfect for running or working out. It's designed to charge with a USB cord, though the creators are still working on getting the device to charge and upload songs at the same time. For a $155 pledge, you can snag your own pair. Toss in a few extra bucks, and you can even choose between colors: black, pearl, purple, citrus or the standard red. No guarantees when it'll actually make it out of development, though.